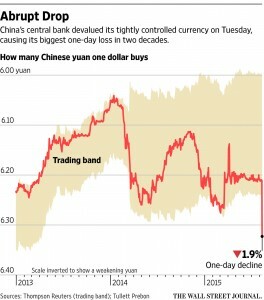 Beijing’s currency move draws rebuke from lawmakers, threatens to impede Obama’s Pacific trade effort. China further devalued the yuan on Wednesday, adding more strains to Washington’s relations with Beijing after Tuesday’s surprise weakening of its currency drew condemnation from U.S. lawmakers. Tuesday’s yuan devaluation, the largest against the dollar in more than two decades, instantly made Chinese goods more competitive with American products, drawing industry complaints and souring the mood of U.S. politicians ahead of an election next year. It will also likely hurt the Obama administration’s push to seal a sweeping trade agreement with Pacific nations. Still, it drew praise from the International Monetary Fund, which called China’s announced new way of valuing the yuan a “welcome step” toward making the currency more sensitive to market forces. China on Wednesday weakened the yuan further, setting the rate that determines that day’s trading in the currency 1.6% weaker than Tuesday’s rate. Still, the new rate was nearly the same as Tuesday’s closing market value for the yuan, and China’s central bank on Wednesday sought to stem concerns of a further slide. “From the perspective of economic and financial conditions both at home and abroad, there is no basis for a continued depreciation of the yuan at this point,” said the People’s Bank of China in a statement on its website. Tuesday’s currency move, a month ahead of a U.S. visit by President Xi Jinping, comes after the two countries have increasingly butted heads over territorial claims in the South China Sea, traded accusations over cyberespionage and quarreled over a new Chinese security law. Bilateral trade talks with Beijing also have stalled. “China is electrifying the currency-manipulation issue at the worst possible time for Obama as he seeks to limit controversy before President Xi’s visit to Washington and also to sweep the TPP currency issue under the rug,” said Michael Wessel, a member of the U.S.-China Economic and Security Review Commission, a congressionally mandated body that monitors the economic and security relationship between the two countries.